Finding the Forgotten | Arts and Culture | Style Weekly - Richmond, VA local news, arts, and events. An invitational exhibition at Candela shows modern photography in a process of rediscovery. 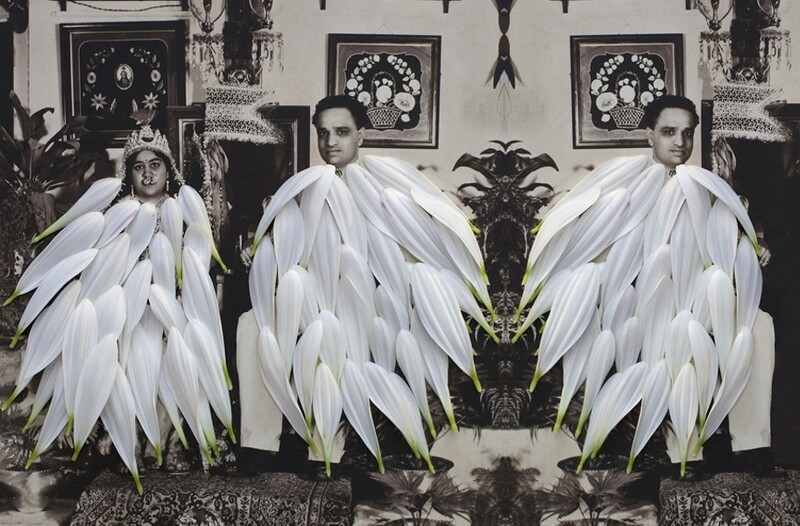 Priya Kambli’s “Dada Aajooba and Dadi Aaji” (2012) is one of the intriguing photographs on display in Candela Books and Gallery’s “Unbound3” exhibit, curated by Gordon Stettinius and Amy Ritchie. As cultural theorist Walter Benjamin remarked nearly a century ago, our world is marked by a proliferation of images. Since that proclamation, it has only increased with digital capabilities that compel us to visually document our every move. In this environment, how does photography separate itself as an art form? Candela Books and Gallery's "Unbound3" a juried and invitational exhibition of 39 artists, seems to suggest the answers are turning inward, mining from its own language and rediscovering the forgotten. The exhibition is understated and even slightly morose. Curated by founding director Gordon Stettinius and associate director Amy Ritchie, it includes work selected by jury from more than 450 submissions, as well as seven invited artists. There are emerging artists, including graduate student Karie Edwards and recent graduate Jaime Johnson, and well-established ones, such as Willie Anne Wright and Larry Fink. They offer a slice of photographic practice in an effort to support photography as an art form and showcase its wide range of styles. Underlying threads of wistfulness, nostalgia and the forgotten seem to percolate throughout. Themes of historic or found occur frequently, appearing in a litany of permutations: recycled media and objects, exposed sites (both external and internal), discarded photographic processes and even self-discovery in the artist's own career. Athena Petra Tasiopoulos takes found 19th- and 20th-century photographs and distorts them into altered realities. Mimicking the language of drawing, the paired single portraits with blank eyes are set against a manila background and hung in two simple, untreated wooden frames, elicit a commanding presence. Likewise, Sandra Klein explores found icons in "Gasterie Brownie," a composite image of a heart organ, scanned from a vintage medical drawing, a photograph and embroidered details. Some photographers have returned to discarded 19th-century photographic processes: the cyanotype, tintype, pinhole camera and wet collodion printing. David Emitt Adams' three works — all tintypes — underscore this element of historicity by being exposed directly onto a found object taken from the photographic site. Other works glean from the artists' histories. A mother and son, Susan Leigh Harrison and Joey Harrison, are represented by two images taken in Michigan in 1950 and 1973 respectively; both negatives were reprinted digitally in 2014. Similarly, Bill Yates is represented by two images from his Sweetheart series, taken from 1972 to 1973 at a roller-skating rink. The series will be featured in a show at the Ogden Museum of Southern Art in New Orleans. "We never started out seeking to exhibit a cross-section of work that exemplifies current practices in photography," Ritchie says, "but we found that every year this is what we ended up exhibiting, and are glad for that outcome." The work by the Harrisons, Larry Fink and Bill Yates keeps the reality of current photo practices in mind, she says, but "the relevance of older photographs and photographers is still very much acted upon in contemporary photography." Lastly, discovery — both psychological and physical — is present in works such as Amy Friend's three digital prints, Jaime Johnson's "Rest" and Willie Anne Wright's "Old Sheldon Church Ruins." In Friend's photographs, figures are both concealed and revealed by a collaged play of dancing lights. The dark, sepia-toned prints coupled with biblical titles about the dichotomous relationship between light and dark suggests the revelation of some hidden inner psyche. Johnson's tea-stained cyanotype, "Rest," captures a presumably dead bird framed by bits of twigs and flowering plants — an offering for the viewer. Similarly, Wright's "Old Sheldon Church Ruins: Gardens Corner, SC" offers a look into the neglected. The blank, featureless faces of the women, dressed in white, standing beside the dilapidated structure, suggest a sense of mystery and unease. To conclude the exhibition, the gallery has planned Cirque de la Candela, a ticketed event that offers "carnivalesque libations and eats" and other amusement park fare including "a mermaid, tarot readings, a pool of sorrows, door prizes, raffle, weight guessing, and sundry stupendous surprises." "Unbound!" runs through Aug. 9, ending with "Cirque de la Candela," at Candela Books and Gallery, 214 W. Broad St. Tickets cost $40. Raffle tickets for $10 also are available in advance and at the event, but you must be present to win. For tickets, call 225-5527.